I’ve stated before that one of the hardest things for me to kick when going Paleo, is the rice. Searching the internet, I stumbled across something fairly interesting: Paleo Rice. At first, I was skeptical. 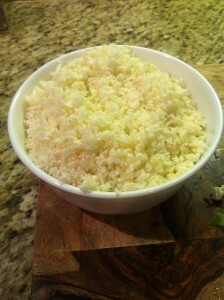 It calls for using pulverized cauliflower to mimic the consistency and texture of rice. Sound weird? Ya, I thought so too as well. So tonight, I hit the grocery store, picked up some cauliflower and decided to give it a whirl. The results were pretty awesome and although it’s not quite rice, it is delicious. This easy recipe is a great Paleo friendly replacement for rice. 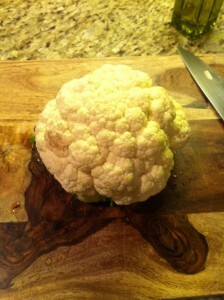 Clean and trim the leafs from the cauliflower head so that all that remains is the florets. Step 2 Cut cauliflower into manageable pieces and place in food processor. Step 3 Pulse processor until cauliflower takes on the shape and form of rice. Pulse further to achieve more of a couscous texture. Step 4 In a dry pot over medium heat, add cauliflower, cover and cook for about 10 minutes or until cauliflower is tender. This experiment turned out pretty good, but I’m thinking, if you were to add say a shallot, some minced garlic, some fresh parsley or a chiffonade of basil, we may be on to something really special here. I served my Paleo Rice along side a delicious oven roasted salmon filet.